Echeveria ‘Fantastic Fountain’ is an unusual succulent with down swept or cascading foliage. This is a rare plant that forms a neat founded plant to around 20 cm in height (8 inches) when mature. This is a select cultivar and it does require a little more care than some other varieties. Good air circulation is also important. Equally important is protection from hot direct sun as it is more prone to leaf burn than most. Choose a position where it gets good morning sun and filtered afternoon light. 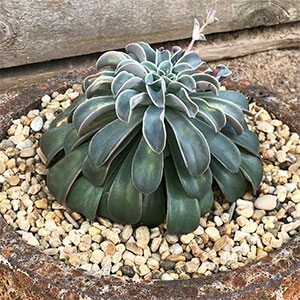 Like most Echeveria ‘Fantastic Fountain’ will produce offsets or ‘pups’. These are the easiest form of propagation and can be removed once they reach a good size. Another new cultivar worth waiting for is ‘Dark Vader’.